Although one of the reasons for additional sanctions was to stimulate democratic reforms in Cuba, the whole point of U.S. policy was to exert economic pressure on the Castro government (and eventually hasten its demise) by stemming the flow of hard currency to the Caribbean island. A spokesman for the U.S. Treasury Department has recently admitted that sanctions against Cuba were mainly intended to “deprive the Castro regime of the financial wherewithal to oppress its people.”3 We can also add that the United States tried to capitalize on Cuba’s economic dilemma and frustrated economic adjustment. Up to 1989, the embargo placed conditions on the 15% of Cuba’s international trade that fell outside the socialist market. However, after 1991, the embargo placed conditions on more than 90% of that trade.4 Under these circumstances, it appears obvious that U.S. policymakers had an unparalleled opportunity to finally get the most out of economic sanctions that had failed for thirty years to overthrow the rule of Fidel Castro in Cuba. There has been considerable debate about just how effective U.S. economic sanctions against Cuba have been in denying hard currency earnings to the Castro government. In light of the available information, it could be argued that the United States has not only been unable to foster fundamental political reforms in Cuba, but has actually contributed to the recovery of the island’s economy from the deep recession of the early 1990s. The purpose of this study is to demonstrate that, in spite of the tightening of the embargo, the United States has played and continues to play quite an important role in the Cuban economy. More specifically, significant amounts of hard currency have been channeled into the Cuban economy through U.S. visitors (including Cuban-Americans), remittances sent by Cuban exiles to their families in the island, American food exports (sold in government- owned dollars stores), and U.S. investors who hold publicly traded shares of major foreign firms engaged in business activities with the government of Fidel Castro. The study also intends to demonstrate that a significant share of hard currency reaching Cuba is in violation of U.S. regulations, thus providing some evidence for the inability of the U.S. government to obtain compliance from its own citizens. The importance of this work resides in the attempt to enrich the general debate on the role and usefulness of economic sanctions and shed light upon a specific aspect that has been generally neglected by scholars of international relations and by the literature on the Cuban embargo. While many scholars tend to evaluate the utility of sanctions by analyzing the behavior of the target government, this study focuses on the citizens of the coercer state. Far from downplaying the importance of economic adjustments devised by the target country to cope with sanctions, the contention of this paper is that U.S. citizens’ economic activities (both legal and illegal) have mitigated the impact of the Cuban embargo and undermined its main goal. The study begins with an analysis of international tourism in Cuba and the presence of U.S. visitors in the island. It continues with an examination of the importance for the Cuban economy of remittances sent from U.S. residents (Cuban exiles) after Cuba’s legalization of dollar holdings in August 1993. Finally, it provides a brief review of recent developments in U.S. food sales to Cuba and American investments in foreign companies that operate in the Cuban market. The conclusion summarizes the main findings of the research and offers some suggestions for a more effective U.S. policy toward the government of Fidel Castro. Figure 1 shows data on gross revenues from tourism, number of tourist arrivals and gross revenues per tourist for the period 1993-2002. According to official figures, arrivals rose from 546,000 in 1993 to over a million in 1996 and reached around 1.68 million at the end of the year 2002. 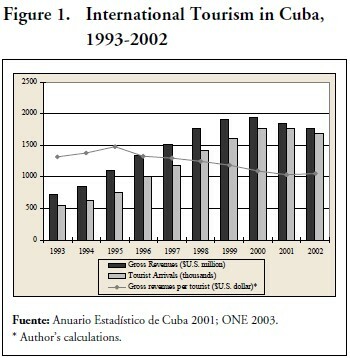 Similarly, gross revenues from tourism increased from $720 million in 1993 to more than $1.9 billion in 2000, making the tourist industry, as Cuban officials often describe it, the “engine” of the island’s economy. For 2002, the National Statistical Office (ONE) reported a slight decrease in gross revenues from tourism in comparison to 2001 ($1.77 billion and $1.84 billion, respectively), but other sources indicate that the decline could have been more pronounced. For instance, the U.S.-Cuba Trade and Economic Council reported that gross tourism revenues were about $1.5 billion in 2002, representing a decrease of approximately 18% from 2001.7 In terms of tourist expenditures, gross revenues per tourist per year increased from $948 in 1991 to $1475 in 1995. However, since then, they decreased steadily and in 2001 they were $1037, just 9% above the 1991 level. This suggests that, if there are not other avenues for the economy to grow in the future outside tourism, the Cuban economy might plateau once the tourist sector reaches its maturity. In 2002, gross revenues per tourist were approximately $1049, only 1.2% above the 2001 level. Since President George W. Bush took office in 2001, OFAC has been cracking down on those who travel to Cuba without permission. During the Clinton Administration, OFAC took steps to levy fines (the average fine is $5,500) on 46 to 188 Americans a year. That figure jumped to 700 in 2001.21 However, these fines affect fewer than 3% of the total number of violators per year, and they target primarily U.S. citizens of non-Cuban descent. As noted by U.S. representative Jeff Flake (R-AZ), U.S. authorities pay no attention to Cuban-Americans even as they harass and level fines against Americans who go to the island. While being allowed to travel for a self-defined humanitarian need, “their relatives always seem to get sick around the same time, like Christmas and other major holidays.”22 In addition, there are several cases of Cuban-Americans who are able to visit Cuba twice a year without asking OFAC for a specific license. Asked to comment about how she was able to visit Cuba twice in 2000 to meet a newborn nephew and to take a vacation on the beach, a Cuban-American replied: “Coming to Havana is very easy. Although I am a U.S. citizen, I am required to have a Cuban passport. So I use my (U.S.) passport to enter and leave the United States and the third party country, while using my Cuban passport for the rest of the journey.”23 In short, whether they target U.S. citizens of non-Cuban descent or Cuban-Americans, travel restrictions are unable to stem illegal travel to Cuba. Even admitting that the threat of prosecution might have discouraged some potential travelers, it is virtually impossible for the U.S. government to prevent its citizens from visiting Cuba and spending money there in violations of U.S. regulations. As a result of the deep economic recession that threatened Cuba’s survival in the early 1990s, the Castro government decriminalized both the possession and the use of hard currency (especially U.S. dollars) in August 1993. In addition, the government legalized dollar-denominated remittances under its 1994 monetary reform program. Since then, family remittances mainly sent from Cuban-Americans have become an important source of supplemental income for many Cubans. Even more important for the purpose of this study, these practices have significantly boosted the domestic dollar market in Cuba. 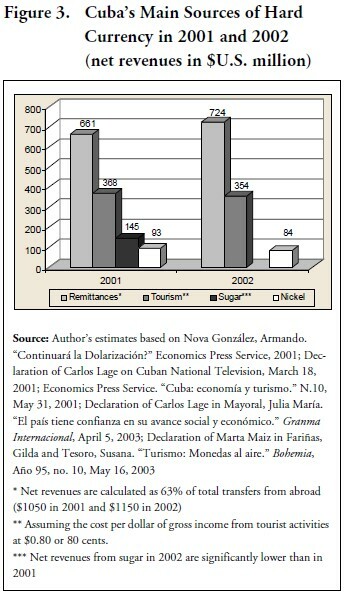 As observed by Ana Julia Jatar-Hausmann, the legalization of the use of foreign currency encouraged more family remittances, and the high prices at governmentowned dollar stores acted as a hidden sales tax on remittances, effectively allowing the Cuban authorities to obtain access to that money.24 In light of this development, several scholars contend that money sent from abroad has been the single most important factor in reactivating the Cuban economy in the second half of the 1990s. Using available information on sales in dollar stores and dollar purchases by CADECA (where Cubans utilize the vast majority of hard currency they receive), it is possible to estimate the level of remittances to Cuba. As I said before, remittances are the most important source of dollars for the Cuban population, but they are not the only one. Thus, in order to estimate the amount of money sent from Cubans abroad to their families in the island, we must consider other ways through which Cubans enter in possession of dollars. Table 3 offers a calculation sample of remittances for the year 2001. Figures for sales in dollar stores are official data provided by the Cuban government, while the other amounts are estimates based on conversations with Cuban economists. Total sales in dollar stores in 2001 were about $1.2 billion, with an additional $100 million of dollar purchases by CADECA. From this amount, we must deduct the dollar income of Cubans who provide services of house-rental,37 restaurants, taxis, etc. (about $70-80 million), tourism-related tips (assuming that direct workers in the tourist sectors earn on average 4-5 dollars a day, the total amount would be approximately $145-180 million), contracts abroad, and incentive payments in dollars and convertible pesos (about $25-30 million). 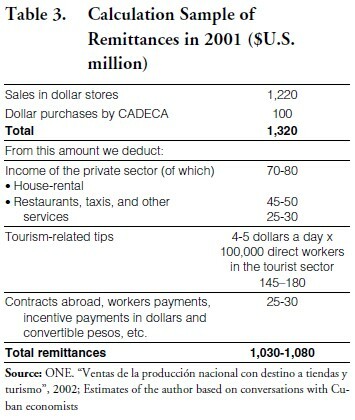 Using sales in dollar stores and dollar purchases by CADECA as a reference, Table 4 provides estimates of remittances to Cuba for the period 1995-2002. Figures from ECLAC are also included in order to make a comparison. Since the legalization of dollar holdings in 1993, remittances to Cuba have increased significantly. ECLAC reports that individuals of Cuban descent sent more than $500 million to their relatives in the island in 1995, while this figure topped at $740 million in 2000. Almost 90% of remittance dollars received came from the United States.39 Sales in dollar stores have experienced a similar expansion, but they increased at much higher rates between 1997 and 2001. In 1997 the total value of sales in dollar stores was $867.4 million, while in 2001 they reached $1,220 million. This suggests that the actual amounts of remittances to Cuba for the period 1997-2001 might have been much higher than those reported by ECLAC. Whereas remittances as calculated by ECLAC increased only by 9% during this period, sales in dollar stores rose by more than 40%. Transactions at CADECA also grew by approximately 25% between 1998 and 2001. Given that most of the “mulas” travel twice a month using different routes, it is likely that money transfers using these entrepreneurs violate the annual limit of $1200 in remittances for U.S. citizens. 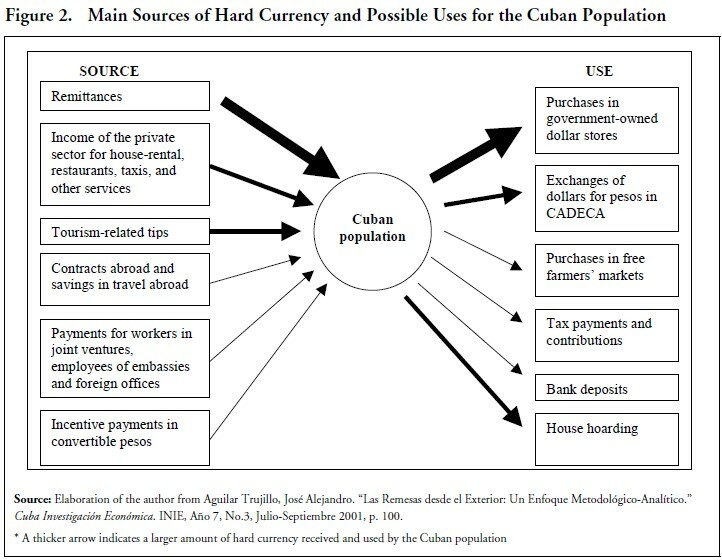 As further evidence, if we divide the author’s estimates of remittances (to be more precise, we can deduct 10% because not all remittances come from the United States) by the estimated number of Cuban-Americans who regularly send money to their families (700,000), we can see that money transfers to Cuba from the United States were on average $1,350 per person in 2001 and $1,478 per person in 2002. Limitations on remittances are perhaps the most contradictory element of current U.S. policy toward Cuba. While being part of a series of U.S. restrictions intended to squeeze the Castro government economically, remittances have been Cuba’s fastest growing hard currency source during the 1990s. To put things into perspective, Figure 3 provides rough estimates of Cuba’s four largest sources of hard currency revenues (net figures) in 2001 and 2002. The total amounts are based on the author’s data, figures released by the Cuban vice-president Carlos Lage and Cuban vice-minister of tourism Marta Maiz, and calculations of some Cuban economists. In the last few years, economic sanctions against Cuba have been under fire in the U.S. Congress. As a result of growing skepticism on the utility of economic coercion as well as lobbying efforts by U.S. business and agricultural communities (in particular food exporters), an increasing number of lawmakers has pushed for a relaxation of the 40-year old embargo and the beginning of a new trade relationship with the Castro government. In October 2000, the U.S. Congress passed the “Agriculture, Rural Development, Food and Drug, Administration, and Related Agencies Appropriations Act, 2001.” Title IX of the bill, signed into law by President Clinton a few weeks later, includes provisions that allow sales of U.S. food and agricultural products (and medicines) to Cuba for the first time in nearly forty years. It should be noted that a clause inserted in the final version of the bill prohibits U.S. companies and financial institutions from providing credits for such transactions, thus obligating the Cuban authorities to complete their purchases only with cash payments or through financing provided by third-countries’ companies. Enraged by that restriction, the Cuban government initially said it would not buy any food until the embargo was completely lifted. Indeed, for about a year after the passage of the U.S. law, Cuba refused to buy “a single grain of rice” from the United States. However, after hurricane Michelle caused widespread damage to the island in November 2001, the Castro government began to take advantage of the law and buy American food to replenish its reserves. The first contract between a U.S. firm and the Cuban government, worth about $40 million, was signed on December 16, 2001. 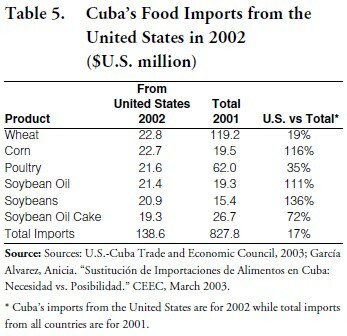 Since then, Cuba has purchased approximately $200 million of American food products.54 Table 5 reports the value of Cuba’s food imports from the United States in 2002 compared to total Cuban imports of the same products in 2001. How do U.S. food sales generate hard currency revenues for the Cuban government? This is quite simple. Although the majority of U.S. commodities exported to Cuba go into ration stores, almost 10% end up in local dollar shops.65 Just as an example, it is reported that products exported to Cuba by Indianabased Marsh Supermarket and sold at governmentowned dollar retail stores continues to rise. Since October 2002, Marsh brand cereals, gelatin desserts, instant pudding, pie filling, and hot cocoa mix have been available in Cuba, with additional items reaching the local hard currency market since January 2003.66 As stated previously, the price mark-up for imported food in government-owned dollar stores is about 240%. Therefore, the 10% of U.S. food sales ($200 million since December 2001) worth approximately $20 million that reached Cuba’s dollar stores would sell for about $48 million, thus generating as much as $28 million in hard currency revenues for the government of Fidel Castro. Given that Castro has promised to increase food imports from the United States in 2003, a growing amount of foreign exchange revenues (once generated by products imported from other countries) will be generated by U.S. trade activities with Cuba. American food sales to the island were up by more than 39% in the first six months of 2003 (as compared to the same period in 2002),67 and they are projected to increase by nearly 20% this year, for a total value of about $166 million.68 U.S. This section provides a brief overview of an increasingly important and largely unexplored aspect of U.S.-Cuba economic relations, that is, the presence of American investors in foreign firms that trade with or invest in Cuba. More specifically, the U.S. Department of the Treasury authorizes individuals and firms subject to United States law to invest in a third country company that has commercial activities in Cuba, as long as they do not acquire a controlling interest of that company and provided that a majority of the revenues of the third country company are not produced from operations within Cuba.69 Thus, if the investment is an indirect one, a U.S. entity should have no problem in building a Cuba-related stock portfolio. In order to give a sense of the importance of U.S. indirect business connections with Cuba, Table 6 provides data on the presence of U.S. shareholders in selected foreign companies that operate in the island’s market. As observed by John Kavulich, “American companies have affiliations with and U.S. citizens have investments in Sol Meliá, Unilever, Accor, Alcan, Fiat, Daimler Chrysler, and Nestlé among many other companies, which have commercial activities within Cuba.” He also notes that, “most of the largest U.S. financial institutions and investment banks provide services for companies that have commercial activities within Cuba.”70 Obviously, Table 6 is just a sample based on public information, and the presence of American investors in certain companies could be higher than that reported. The key aspect is that, in an increasingly globalized world, the nationality of a specific firm may become almost irrelevant. The following are some details of specific U.S. indirect links with Cuba as reported by the U.S.-Cuba Trade and Economic Council and by financial reports of individual companies. • In 2000, Texas-based American Airlines Inc. owned 2% of Spain-based Iberia Airlines and California-based Capital Research and Management Co. owned 10.41% of Japan-based Mitsubishi Motors.74 Iberia Airlines has a joint venture (Empresa Logística de Carga Aérea S.A.) with the Cuban company Aerovaradero S.A. involving a new freight terminal in the vicinity of the José Martí International Airport, and another joint venture (Empresa Cubano-Hispana de Mantenimiento de Aeronaves IBECA S.A.) for aircraft maintenance.75 Mitsubishi sells automobiles, spare parts, and accessories to Cuba through the Panamanian company Motores Internacionales del Caribe S.A.
• In 2000, New York-based Lehman Brothers Holdings Inc. purchased 3% of the shares of Italy- based Olivetti S.p.A. Telecom Italia S.p.A., a subsidiary of Olivetti, has a joint venture (ETECSA) with the Cuban telephone company EMTEL for the modernization and expansion of Cuba’s telephone system. In terms of capital invested, ETECSA is one of the most important joint ventures operating in Cuba. Also in 2000, Florida-based Carnival Corporation increased indirect minority presence in Cuba through the purchase by United Kingdom-based Airtours PLC of 50% of Spain-based Hotetur Club S.L. Carnival Corporation owns 26% of the shares of Airtours PLC.76 Hotetur Club has management contracts in three hotels in Cuba, the Deauville in Havana, the Hotetur Palma Real and the Hotetur Sun Beach in Varadero. It is quite difficult to offer a comprehensive analysis of U.S. indirect business connections with Cuba, given that private companies are not required to make public the list of their shareholders. Such an endeavor is also complicated by the fact that, with millions of dollars moving around the world every second via electronic transactions, the real origin of financing for specific business operations is often unknown. 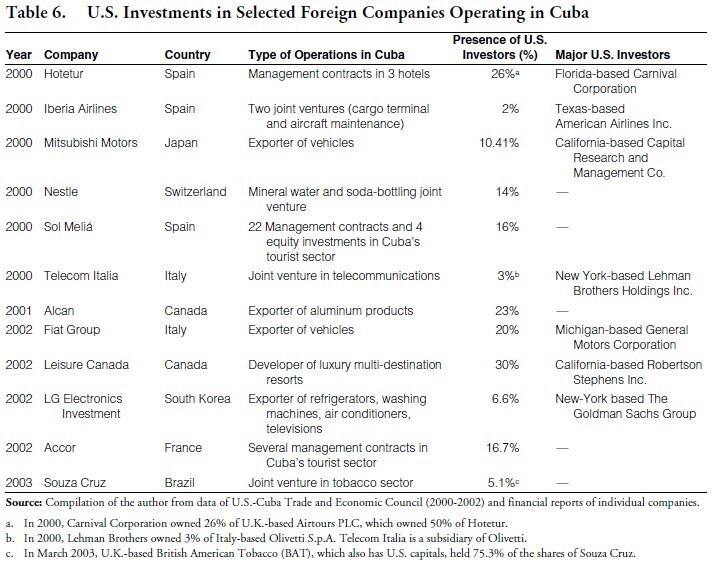 As Everleny Pérez reminds us, “there are many companies in Cuba that are based in the Bahamas, other Caribbean islands, Spain or Britain, and you really can’t tell if these companies receive U.S. funds attracted by the high interest rates we (Cubans) pay.”84 Nevertheless, the information presented in Table 6 shows that American entities hold publicly traded shares of several major foreign firms engaged in business activities with the government of Fidel Castro. While profits from the Cuba-related stock portfolio may not be particularly significant for some U.S. investors in terms of their global revenues, American investments in foreign companies that operate in the island are just another example of gaping holes in the United States’ effort to isolate Cuba economically. If we consider that some of these foreign firms have provided Cuba much-needed capital, technology, management expertise, and new markets for its main exports, then the importance for the Cuban economy of U.S. indirect business operations in the island appears evident. From the analysis presented in this paper, we can argue that, in spite of the tightening of the embargo, the United States has contributed in a significant way to the recovery of the Cuban economy following the deep recession of the early 1990s. While intended to stimulate democratic reforms and exercise pressure for regime change in Cuba by stemming the flow of hard currency to the island, U.S. economic sanctions have achieved neither of these goals. Admittedly, the role of the United States in the Cuban economy would have been much more important in the absence of sanctions. However, even with restrictions in place, significant amounts of hard currency have been channeled into Cuba through direct and indirect means of travel, remittances, food sales and secondary investments. Washington’s policy toward Havana ended up throwing a lifeline to the same government it was supposed to undermine. In light of this situation, two possible options are available to U.S. decision-makers for a more successful policy toward Cuba. The first option is to strengthen current restrictions on travel and remittances by significantly reducing the number of U.S. citizens authorized to visit the island and the amount of money that Cuban-Americans can send legally to their families. In order to be effective, these measures should increase the level of scrutiny for potential violations on travel and money transfers as well as hold citizens of Cuban descent to the same standards as any other American. While such a policy may be unpopular and quite expensive to implement, it makes no sense to make exceptions for a specific group of U.S. citizens that channel into Cuba more hard currency than any other group. Recent changes of rules on travel and remittances introduced by the Bush administration in March 2003 do not help much in this regard. The new regulations put an end to “people to people” exchanges (travel permits no longer will be granted to numerous organizations that had allegedly used the licenses to build tour-operator businesses), facilitate Cuban-American visits to their families in the island by eliminating the requirement for “humanitarian need,” and allow travelers to carry up to $3,000 in remittances for 10 households, up from $300. Although these measures may appear expansive at a first glance, they simply legalized what could not be prevented and may well lead to an increase in the flow of hard currency to Cuba. In single trips, “mulas” and other entrusted agents already carried thousands of dollars in remittances to be distributed to many different households in Cuba. While U.S. citizens can now carry more money with them, there is no guarantee that informal practices will be reduced. In addition, the new rules will probably trigger a rise of both illegal trips to the island by U.S. citizens not of Cuban descent and Cuban-American visits to their families. At any rate, it should be noted that so far U.S. authorities have taken no enforcement actions against Cuban-Americans for violations on travel. The general requirement for “humanitarian need” was so broad that it was hardly worthwhile to scrutinize. A second option, which is not necessarily more viable politically but certainly less expensive than the first one, is to promote a rapprochement with Havana and a gradual removal of the embargo in recognition that economic sanctions have not achieved their main goals. A policy that respects the rights of Americans to trade with, invest in, and travel to the island may more effectively serve U.S. interests in post-Soviet Cuba by defending human rights, helping the Cuban people, and spreading the values of the American society.86 It would also increase pressure on the current government in Havana by preventing Fidel Castro from using his traditional argument that the United States promotes economic deprivation in Cuba and seeks to constrain Cuban sovereignty. In short, unless significant steps are taken in one of the suggested directions, the United States will have no choice but to wait until Castro passes from the scene by natural causes, and hope his successor will be less resilient than him, or perhaps more inclined to introduce extensive democratic reforms. To conclude, consider a recent quote by U.S. president George W. Bush that exemplifies the great irony of economic sanctions with respect to Cuba. In May 2002, Bush stated: “The sanctions the United States enforces against the Castro regime are not just a policy tool, but a moral statement. It is wrong to prop up a regime that routinely stifles all the freedoms that make us human.”87 If this is the case, then the findings of this paper demonstrate that U.S. policy toward Cuba in the post-Cold War era has been nothing else than a “wrong” policy. 1. This paper is mostly based on field research conducted in Cuba during the summer of 2003. The Center for Latin American Studies at the University of Florida and a Wilgus Research Grant financially supported travel to Cuba and the preparation of this paper. The author alone is responsible for the content and interpretations. 2. Domínguez, Jorge I. “U.S.-Cuban Relations: From the Cold War to the Colder War.” Journal of Interamerican Studies and World Affairs, v. 39, n. 3, Fall 1997, p. 49. 3. Kirkpatrick, David D. “U.S. Halts Cuba Access by Educational Groups.” The New York Times, May 4, 2003. 4. Schwab, Peter. Cuba: Confronting the U.S. Embargo. New York: St. Martin’s Press, 1999, pp. 71-72. 5. Brundenius, Claes. “Tourism as Engine of Growth. Reflections on Cuba’s New Development Strategy.” Paper presented at the 2003 meeting of the Latin American Studies Association (LASA), Dallas, Texas, March 27-29, 2003. 6. Figueras Pérez, Miguel Alejandro. “El Turismo Internacional y la Formación de Clusters Productivos en la Economía Cubana.” In Cuba. Reflexiones Sobre su Economía. Universidad de La Habana, 2002, p. 112. 7. U.S.-Cuba Trade and Economic Council (USCTEC). Economic Eye on Cuba (20-26 January 2003). 8. Robyn Dorothy, Reitzes James D. and Church Bryan. “The Impact on the U.S. Economy of Lifting Restrictions on Travel to Cuba.” The Battle Group, Center for International Policy, Washington D.C.: July 15, 2002, p. 2. 9. Eckstein Susan and Barberia Lorena. “Cuban-American Cuba Visits: Public Policy, Private Practices.” Report of the Mellon-MIT Inter-University Program on Non-Governmental Organizations and Forced Migration, Center for International Studies, Massachusetts Institute of Technology, January 2001, p.12. 10. Lexington Institute. “Cuba Policy Report: The Bush Administration Unveils its Travel Policy.” April 7, 2003. 11. Susan Eckstein and Lorena Barberia argue that there is contradictory information about Cuban-American visits to Cuba. According to them, while Cuban sources report that individuals of Cuban descent visiting the island between 1994 and 1996 were about 20,000 per year, U.S. sources estimate that the actual number was approximately 40,000 in 1994 and 100,000 per year between 1995 and 1999. Eckstein and Barberia (2001). See note 8, p.13. 12. In 1995, Canada (143,541) was the most important source of visitors to Cuba, followed by Italy (114,767), Spain (89,501), and the United States (59,972). In 1998, Canadian travelers to Cuba were 215,644, followed by Italians (186,688), Germans (148,987), and individuals from the United States (141,678). 13. The Economist. “Embargo or not, US is now Fidel Castro’s economic partner.” January 7, 2003. 14. United States International Trade Commission (USITC). The Economic Impact of U.S. Sanctions With Respect to Cuba. February 2001. 15. Oppenheimer, Andres. “U.S. may tighten Cuba travel.” The Miami Herald, December 15, 2002. 16. Interview with a Cuban economist in Havana, May 27, 2003. 17. Guy Allard, Jean. “Record de visitantes procedentes de EE.UU.” Granma Internacional, January 7, 2003. 18. U.S.-Cuba Trade and Economic Council (USCTEC). 2002 Commercial Highlights http://www.cubatrade.org/2002Lst.pdf (hereinafter “USCTEC 2002”). 19. Sullivan, Kelly. “Americans defy Cuba embargo.” Washington Post Foreign Service, October 31, 2001. 20. Moreno, Jenalia. “Cuba back into game of tourism.” The Houston Chronicle, February 28, 2003. 21. “Americans who make trips to Cuba without OK could be prosecuted.” The Houston Chronicle, March 9, 2003. 22. Eaton, Tracey. “8 vow to have U.S.-style meeting in Cuba.” The Dallas Morning News, March 11, 2003. 23. “Forbidden fruit of Cuba lures U.S. travelers.” IPS. November 1, 2001. 24. Jatar-Hausmann, Ana Julia. “Cuba: Is America Business Missing Out? Sí, A Bright Future.” Across the Board, July-August 2000. 25. Monreal, Pedro. “Las Remesas Familiares en la Economía Cubana.” Encuentro de la Cultura Cubana, N.14, Otoño de 1999. 26. Lage, Carlos. Declaration on Cuban National Television (Noticiero Nacional de la Television Cubana), March 18, 2001. 27. “Cuba: economía y turismo.” Economics Press Service. N .10, May 31, 2001. 28. Fariñas, Gilda and Tesoro, Susana. “Turismo: Monedas al aire.” Bohemia, Año 95, No. 10, May 16, 2003. 30. An ever-increasing number of Cubans are turning to the Transcard (a Canadian company) as a fast, efficient, and less costly alternative to receiving remittances via Western Union. Individuals outside of Cuba can establish accounts in any Transcard office throughout the world and designate a Cuban national as the beneficiary, who is issued a credit card to access the account and make purchases. See U.S.-Cuba Trade and Economic Council (USCTEC). Economic Eye on Cuba, 27 October 1997 to 2 November 1997. It must be noted that transactions with Transcard are routed via Canadian banks, thus avoiding control from U.S. authorities. 31. Interview with a Cuban economist in Havana, June 9, 2003. 32. Interview with a Cuban economist in Havana, May 20, 2003. 33. Barberia, Lorena. “Remittances to Cuba: An Evaluation of Cuban and U.S. Government Policy Measures.” The Rosemarie Rogers Working Paper Series, The Inter-University Committee on International Migration, Massachusetts Institute of Technology, September 2002, p. 13. 34. Johnson, Tim. “U.S. action after Cuba crackdown debated.” The Miami Herald, May 5, 2003. 35. It must be noted that Cubans with contracts abroad such as musicians, technicians, and other professionals may also obtain payments in hard currency. However, very few people are included in this category and the amount of dollars generated by these activities, while significant at the individual level, remains overall almost negligible. 36. Interestingly, some Cuban economists argue that the level of hoarding in Cuba could be as high as $500 million. Interview with a Cuban economist in Havana, May 20, 2003. 37. It is reported that there are currently 2,705 people with licenses who rent (charging dollars) rooms to foreigners in Havana, where 80-85% of all Cuba’s dollar renters are located. In addition, there are an estimated 5,200 unlicensed renters around the country who charge dollars or other foreign currencies. See Grogg, Patricia. “Landlords on the verge of a nervous breakdown.” Inter Press Service (IPS), July 4, 2003. 38. Interview with a Cuban economist in Havana, June 3, 2003. If remittances represent about 80% of all dollar sources for the Cuban population, then they would be approximately $1,050 million in 2001. 39. Orozco, Manuel. “Challenges and Opportunities of Marketing Remittances to Cuba.” Inter-American Dialogue, Washington D.C., July 27, 2002, p.1 (hereinafter “Orozco 2002”). 40. Interview with a Cuban economist in Havana, June 18, 2003. 41. Interview with a Cuban economist in Havana, May 20, 2003. 42. Eckstein, Susan. “Diasporas and Dollars: Transnational Ties and The Transformation of Cuba.” The Rosemarie Rogers Working Paper Series, The Inter-University Committee on International Migration, Massachusetts Institute of Technology, February 2003, p. 15 (hereinafter “Eckstein 2003”). 44. Inter-American Development Bank (IADB). “Sending Money Home: An International Comparison of Remittance Markets.” February 2003. 46. Personal conversation with Manuel Orozco, April 5, 2003. 47. Hegeman, Roxana. “Exiles prop up Cuban economy by sending money to families.” Associated Press, November 28, 1997. 48. Arreola, Gerardo. “Canadian company exploits family remittances exceeding $1 billion yearly.” La Jornada, November 27, 2002. 49. Economist Intelligence Unit (EIU). “Remittances flows become easier.” Country Report: Cuba, February 1, 2003. 51. Nova González, Armando. “Continuará la Dolarización?” Economics Press Service, 2001. 52. Triana Cordoví, Juan. “Cuba; Desempeño Económico en el Primer Semestre del 2002.” Centro de Estudios de la Economía Cubana (CEEC), Havana, 2002. Sugar prices dropped by 27% in the first six months of 2002. 53. Interview with a Cuban economist in Havana, June 5, 2003. 54. Frank, Marc. “US-Cuba trade group wants Havana food show to go on.” Reuters, June 20, 2003. 55. Snow, Anita. “United States become Cuba’s No. 1 source of imported food.” Associated Press, March 2, 2003 (hereinafter “Snow 2003”). 56. U.S.-Cuba Trade and Economic Council (USCTEC). Economic Eye on Cuba, February 17-23, 2003. It must be noted that Cuban authorities estimated American food purchases in 2002 at $189 million, because they include transportation, taxes, and other additional costs. 57. Economics Press Service. “Las compras en números.” March 15, 2003, p. 10. Preliminary statistics from the U.S. Department of Agriculture’s Foreign Agricultural Service indicate that Cuba imported about $452 million worth of farm products in 2002. 58. Jordan, Pav. “U.S.-Cuba Trade Grows Despite Restrictions.” Reuters, February 17, 2003. 59. Frank, Marc. “Cuba slashes imports amid ongoing cash crunch.” Reuters, October 15, 2002 (hereinafter “Frank 2002”). 60. For further information see Statistics Canada, June 29, 2003 at: http://strategis.ic.gc.ca/sc_mrkti/tdts/tdo/tdo.php. 61. Douanne Francaises. “Echanges commerciaux bilateraux en 2002.” Statistics of the French Embassy in Havana, May 2003. 63. Europa Press. “La balanza comercial de España con Cuba registró un saldo positivo de 316 millones de euros en 2002.” June 13, 2003. 65. Personal conversation with John Kavulich, president of U.S.-Cuba Trade and Economic Council, April 11, 2003. 66. U.S.-Cuba Trade and Economic Council (USCTEC). 2003 Commercial Highlights. http://www.cubatrade.org/2003Lst.pdf (hereinafter USCTEC 2003). 67. U.S.-Cuba Trade and Economic Council (USCTEC). Economic Eye on Cuba, August 11–17, 2003. 68. Huettel, Steve. “Tampa port officials will travel to Cuba.” St. Petersburg Times, June 12, 2003. 69. U.S.-Cuba Trade and Economic Council (USCTEC). 2000 Commercial Highlights http://www.cubatrade.org/ (hereinafter “USCTEC 2000”). 70. “U.S. goods, people, cash pour into Cuba.” Reuters, July 28, 2001 (hereinafter “Reuters 2001”). 72. Spadoni, Paolo. “Foreign Investment in Cuba: Recent Developments and Role in the Economy.” In Cuba in Transition—Volume 12. Association for the Study of the Cuban Economy (ASCE), 2002, p.170 (hereinafter “Spadoni 2002”). 73. Pérez Villanueva, Omar Everleny.” El Papel de la Inversión Extranjera Directa en el Desarrollo Económico. La Experiencia Cubana.” Centro de Estudios de la Economía Cubana (CEEC), March 2003, p. 91. 76. U.S.-Cuba Trade and Economic Council (USCTEC). 2001 Commercial Highlights http://www.cubatrade.org/. 79. Interestingly, U.S. entities hold more shares (16.7%) of the French group Accor than any other international investor. Major shareholders are also from the United Kingdom (16.3%), Germany (5.2%), Belgium (3.7%), Luxembourg (2.9%), and Switzerland (2.5%). The complete list of Accor shareholders by country as of December 31, 2002 can be found at: www.accor.com. 80. On June 11, 2003, Leisure Canada reported that the company had created a hotel brand (Mirus Resorts and Hotels) to use on properties within Cuba. The Canadian firm has been given the right to manage the Monte Barreto hotel in Havana under the new brand. According to the company, “the development of a hotel brand that can quickly transfer to a North American hotel chain, once the doors to Cuba open, further establishes Leisure Canada’s vertically integrated gateway to Cuba.” USCTEC 2003. For further information also see: www.leisurecanada.com. 81. “Accor: Big groups turn eyes toward Cuba.” DTC News. Directorio Turístico de Cuba, 2003. It is reported that the Novotel Miramar in Havana, run by Accor since 2000, is now managed by the Spanish group Occidental Hotels & Resorts. For further information see “Hoteles-Occidental entra en Cuba y baja ventas un 11% en 2002.” Granma Internacional, June 9, 2003. 82. The list of Souza Cruz shareholders is available at: www.souzacruz.com. 83. Spadoni 2002, p. 167. 85. Eckstein 2003, p. 16. 86. Peters, Philip. “A Policy toward Cuba that Serves U.S. Interests.” Washington D.C.: The Cato Institute, November 2, 2000. 87. U.S. Department of State. “The United States and Cuba.” International Information Programs. http://usinfo.state.gov/regional/ar/us-cuba/.